AN exhibition featuring scenes of Bristol and the surrounding area painted by Downend artist Paul Weaver is to be held in one of the city’s more quirky galleries. Called Bristol and Beyond, the exhibition is taking place at Steak of the Art on Harbourside from September 15 until October 6. 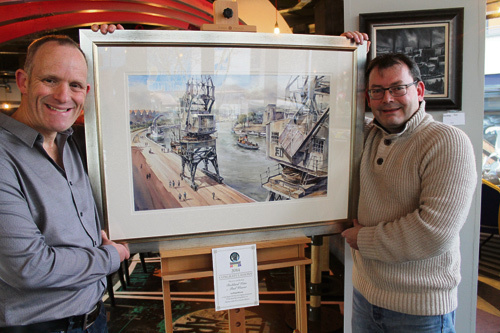 Paul, winner of the 2014 Harbourside Art Prize, specialises in watercolours that capture townscapes, markets and the bustle of the city. The original paintings can be seen for free at the gallery / restaurant which also features works by other popular contemporary British artists and are available to buy. Steve Bowen, who owns the restaurant and is an art enthusiast said: “When we opened Steak of the Art our intention was to showcase work by local Bristol artists, so we’re delighted to have this exhibition by Paul in our gallery. “There is something about Paul’s work that just makes you stop and take a second look and he really does capture the essence of Bristol which is just as captivating as places such as New York or Venice. The art gallery is open from 11am to 11pm Monday to Saturday and 11am to 9pm on Sundays.